At one point in time the majority of digital marketing was free — you may even think it still is! If you really want to get a return on your time investment (e.g. posting on Facebook), you may need to start paying to play! If your business has a Facebook page, you are lucky if 15% of your followers see your content posts. Quite often, the numbers are closer to 3%! If you were willing to pay even $7, Facebook might show it to 1,500 additional people (but not necessarily people who follow your page)! In early March, Google made a change to their landscape (the Search Engine Results Page or SERP), by removing ads from the right hand side and putting four ads at the top of the SERP. The layout of the page is now 4 ads, 3 Google My Business locations (plus a map) and then organic listings. Google My Business (e.g. Maps) — For many queries, Google Maps shows up immediately below the paid ads, so it is important to be visible there if you are a bricks-and-mortar business (e.g. you have a physical location). 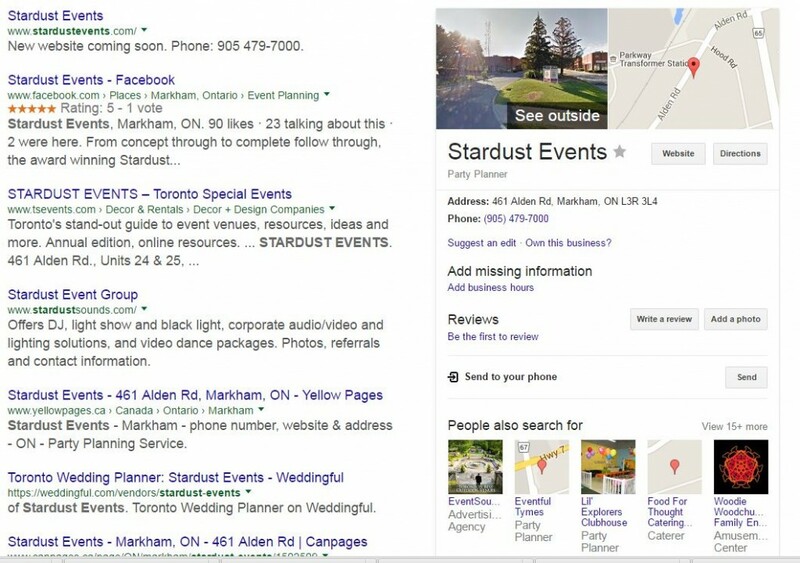 Directories — For searches on your brand, ideally your website shows up first in Google, perhaps followed by your Facebook page, your Twitter account and then perhaps your listing in directories such as TSEvents.com. Did you know that you can track your return on investment from such directories by checking your analytics (e.g. Google Analytics) Referral Sources to see how much traffic you acquired from each directory you are listed in? If you have goals set up, you can also tell if that directory was a source of quality traffic. At TSEvents.com, we are going a step further in tracking: clicks to your website, clicks on your phone number (from our website), clicks on your email address (from our website), clicks out to your social media platforms from our website (e.g. Twitter and Facebook). You can easily track all of this from your site as well using a combination of Google Analytics and Google Tag Manager! Other directories to consider (depending upon your industry) are Yelp and Kijiji. All is not lost … on Google you have organic results and Google My Business (maps). Longer tail searches continue to drive a great deal of traffic thanks to increased use of voice (people speaking into their phone) to conduct searches. Google rewards good content — content that is unique and answers questions your visitors did not even know they had. Make sure your website has the most complete, user-friendly content of any of your competitors (locally and beyond). Incorporate some images and videos; check the Google Search Console (formerly Google Webmaster Tools) monthly to see what people are searching for and tweak your content accordingly. Rinse and repeat and over time you will significantly increase traffic to your site from search engines. The good news is that search engines tend to drive very high-quality traffic! On Facebook, if you don’t want to pay, find influencers in your industry — brand ambassadors willing to share your blog posts on their wall, with other people, to specific groups, etc.